Public land and natural resource managers in the United States are confronted with increasingly complex decisions that have important ramifications for both ecological and human systems. The scientists and technical professionals at the U.S. Geological Survey Fort Collins Science Center—many of whom are at the forefront of their fields—possess a unique blend of ecological, socioeconomic, and technological expertise. Because of this diverse talent, Fort Collins Science Center staff are able to apply a systems approach to investigating complicated ecological problems in a way that helps answer critical management questions. In addition, the Fort Collins Science Center has a long record of working closely with the academic community through cooperative agreements and other collaborations. The Fort Collins Science Center is deeply engaged with other U.S. Geological Survey science centers and partners throughout the Department of the Interior. As a regular practice, we incorporate the expertise of these partners in providing a full complement of “the right people” to effectively tackle the multifaceted research problems of today’s resource-management world. 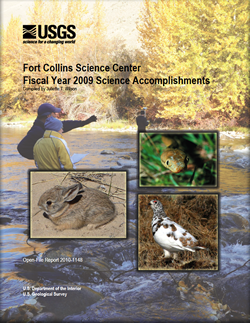 In Fiscal Year 2009, the Fort Collins Science Center’s scientific and technical professionals continued research vital to Department of the Interior’s science and management needs. Fort Collins Science Center work also supported the science needs of other Federal and State agencies as well as non-government organizations. Specifically, Fort Collins Science Center research and technical assistance focused on client and partner needs and goals in the areas of biological information management and delivery, enterprise information, fisheries and aquatic systems, invasive species, status and trends of biological resources (including human dimensions), terrestrial ecosystems, and wildlife resources. In the process, Fort Collins Science Center science addressed natural-science information needs identified in the U.S. Geological Survey Science Strategy (http://www.usgs.gov/science_strategy), including understanding and predicting change in ecosystems, climate variability and change, energy development and land management, the role of the environment and wildlife in human health, freshwater ecosystems, data integration, and evolving technologies. Several science projects were expanded in Fiscal Year 2009 to meet these evolving needs. Wilson, J.T., comp., 2010, Fort Collins Science Center—Fiscal year 2009 science accomplishments: U.S. Geological Survey Open File Report 2010-1148, 47 p.